PSNI Deputy Chief Constable Drew Harris has pledged to focus on protecting the vulnerable after being appointed as the new Garda Commissioner. Mr Harris becomes the first Irish police chief appointed from outside the state and said he was honoured to join the force at a time of change. The 53-year-old has a history of close co-operation with his colleagues south of the border on issues such as tackling terrorism. He takes up the post in September after winning an international recruitment competition. Mr Harris said: "Throughout my career I have been concerned and driven by the need to protect society and in particular the vulnerable, and that will be my focus over the next five years as commissioner, keeping people on the island of Ireland safe and helping to secure the state." 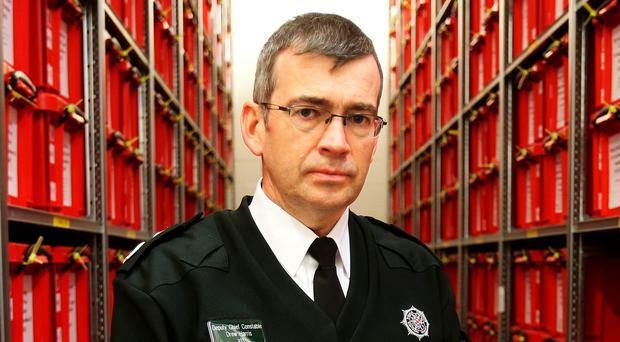 PSNI Chief Constable George Hamilton paid tribute to his outgoing deputy. "He is a man of unfathomable strength, humility and grace and I have been privileged to have him serve as my deputy chief constable for almost four years," Mr Hamilton said. It is understood Mr Harris has applied for an Irish passport. Mr Harris is a former RUC officer whose father Alwyn, also a senior RUC officer, was killed by an IRA bomb in 1989. As the 21st Garda commissioner, he will maintain common cause with the PSNI as it tackles the ongoing violent threat from dissident republicans opposed to the peace process. He will also face the challenges posed by Brexit to cross-border policing. Mr Harris leads the Garda at a time of major reform. His predecessor as commissioner stepped aside after an "unending cycle" of questions over her role. Noirin O'Sullivan said she had been trying to rectify the failures and mistakes of the past. There were queries over how she dealt with officers inflating the number of breathalyser tests carried out and police whistleblowers. More recently, concerns have emerged about police record-keeping. The Police Federation for Northern Ireland said the appointment was "ground-breaking and historic". Its chair Mark Lindsay said: "Drew Harris is an outstanding police officer and an individual who has unrivalled experience at the very highest levels. "His grasp of the wide range of issues affecting policing in both jurisdictions means that Mr Harris comes well prepared for the challenges ahead." Former Justice Minister David Ford welcomed the appointment. "Drew Harris has had a distinguished career in the RUC and PSNI, culminating in his present post of Deputy Chief Constable. "His appointment as Commissioner of An Garda Siochana is well-deserved recognition of his achievements and I wish him well in the post." SDLP MLA Dolores Kelly said Mr Harris would have "a challenging role ahead". She added: "The timing of this appointment is critical, given that post-Brexit, North-South policing relations will be of utmost importance." UUP policing spokesperson Alan Chambers said Mr Harris's appointment was "a tremendous personal achievement". Sinn Fein said the party "will work constructively" with him and will "hold him to account". Secretary of State Karen Bradley said: "This is a critically important post and I am delighted that An Garda Siochana will be able to draw on Drew's vast policing experience, which is as broad as it is deep." Taoiseach Leo Varadkar said: "Our priority was to get the best person for the job, and we have done that." Irish justice minister Charlie Flanagan said he was looking forward to working with Mr Harris "on our shared objective of ensuring the security of the State and the safety of the public". Mr Harris has spent 34 years as a police officer. He said he came to the force at a "time of change", adding that it was a privilege to lead the Garda. He will receive a salary of €250,000 (£220,000), increased from €180,000 (£158,000) to attract interest.